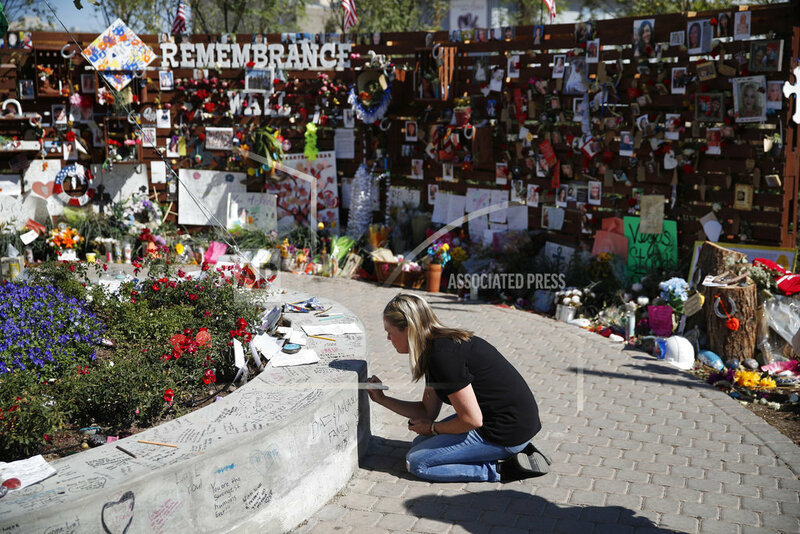 LAS VEGAS (AP) — The day after a gunman opened fire on a country music festival from a high-rise Las Vegas hotel, a local landscaper was at City Hall with an idea for remembering the 58 people killed in the deadliest shooting in modern U.S. history. Jay Pleggenkuhle (PLAY-ghen-kool) of Stonerose Landscapes said he thought the people of Las Vegas needed a project to help them work through their grief. His business partner, Daniel Perez, pushed him to tell city officials about the idea for a temporary “pop up” garden where people could mourn. Officials identified a quarter-acre city lot in the downtown arts district originally slated for a dog park and suggested the garden be made permanent. With city approval, the land and a plan drawn on a paper napkin, the landscaping team asked their contractor friend Mark Hammelmann for help. More than 1,000 volunteers joined in. Over the next three days, the dirt lot was leveled, concrete bricks placed and a heart-shaped garden was filled with purple pansies, red and white roses and bright pink petunias. A temporary “Remembrance Wall” was hammered together from wooden pallets. Trees and shrubs were planted. Neighbor John Pacheco, a local artist now dubbed the “garden mayor,” served coffee to volunteers. The Uber ride-sharing service is still providing free rides to anyone who travels to and from hospitals or blood banks, local driver Cheryl Hyatt said. She visited the garden Sunday to look for the photograph of Sonny Melton, a 29-year-old registered nurse from Big Sandy, Tennessee, who died in the shooting. “There he is,” she said, pointing at his smiling image attached to the wall. Hyatt said she had driven him and his wife, Heather, from the airport when they arrived for the music festival and remembered him because of his big personality. Organizers of the garden said it is those happy memories they hope will emerge among visitors, along with a sense of community and connection. Two weeks after the massacre, scores of people come each day to the garden where a pair of cowboy boots, a skateboard and other victims’ belongings are displayed. They gaze at smiling photographs of the victims and written messages from their loved ones. Visitors have included a rabbi who drove from Caspar, Wyoming, and a family who flew in from Washington D.C., Pleggenkuhle said. Las Vegas magicians Siegfried and Roy donated a $10,000 oak to serve as a “tree of life” representing the people still alive, McMayon said. Nurseries donated other plants, including 58 tupelo trees, each one representing a person lost in the attack. Volunteers built the wall, laid the brick and planted grass for several small lawns. Tags: Las Vegas, Mass Shooting, memorial. Bookmark the permalink.